I love making barbecue sauces but they can be a process. Here’s a spicy/sweet little number with some Chipotle heat that needs nothing more than a quick stir and few minutes of time. 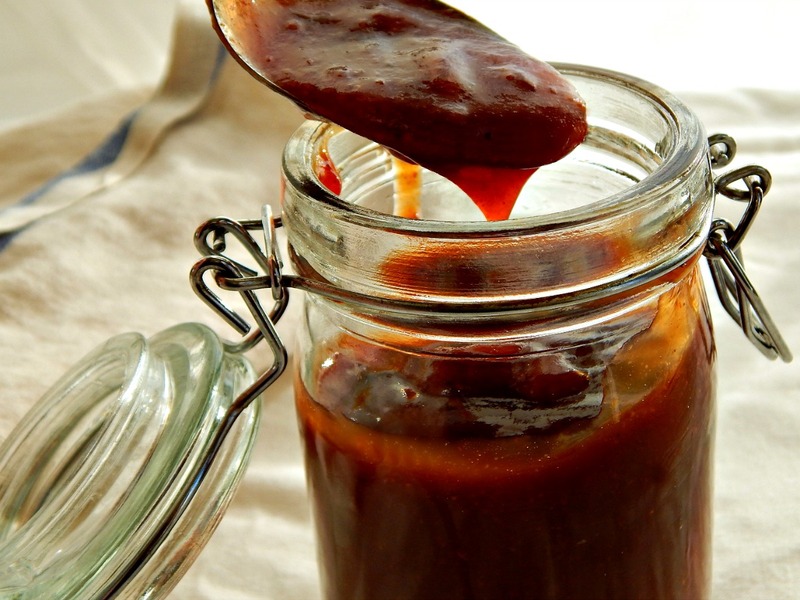 It’s a little bit of a miracle – you’d never guess by the taste how quick and simple this Honey Chipotle Barbecue Sauce is to make and that it’s whipped together with pantry ingredients. This is a great recipe to have on hand whenever you happen to run out of barbecue sauce and/or might be a little low on fresh ingredients – but it might just win you over and become your “go to” sauce. Mix all ingredients together. Let sit for several minutes, which will help the sugar dissolve, mix again and adjust flavorings to taste. This will thicken a bit more if refrigerated. Simply bring up to room temperature. This entry was posted in Click here for Fabulous Food Posts and tagged Barbecue Sauce, Chipotle, Frugal Hausfrau, ketchup. Bookmark the permalink. I’m thinking grilled chicken and spring. Unfortunately my grill is frozen. Thanks for sharing with us at Fiesta Friday. Happy FF! Pinned! lol! Mine is in the garage…but this was really good on the Country Style Ribs I made. 🙂 Have a good one, Quinn! You are definitely speaking my language here. Love a good smokey sauce! Good to read the liquid smoke can be optional. I don’t have any but do have everything else to make this sauce. Delicious. I really liked this one a lot! But then it seems I like ALL my food, but really I make a lot of things that never get on the blog at all….this is a keeper, though! AwesomeSauce Mollie! It does look easy to make and I always have chipotles in adobo sauce in my freezer, because my gosh who could use a whole can of it in something?! OMG that’s hilarious! I’m sure my 17-yo daughter would shame me in the same way, lol! Seems nice but what is liquid smoke? It’s a product that was made to duplicate the flavor of smoked meats – wood chips are burned then the smoke goes through a condenser and is distilled into a liquid essence. Completely optional, but it is a nice little “cheat” for some barbecue flavor. Great pictures! I will have to scour around for liquid smoke.I’m sure it is a key ingredient. And thanks! I wasn’t happy with the pic – I just can’t get my camera to “see” what I see, lol! !